The process of refining crude into the fuels that power our modern infrastructure produces what we now know as diesel fuel as a byproduct. Thanks to the hard-bitten development of the diesel engine in the late nineteenth century, we are able to use even this substance as a form of highly efficient fuel. Diesel makes international trade and commerce on our modern scale possible, while boasting its own array of vehicles, military equipment, and electrical generators. A Solution for Cold Weather Crystalization? Unfortunately, diesel does have its drawbacks. Some of these, such as the tendency of diesel motors to be noisy, can be dealt with relatively simply. Some, like the smell, can simply be ignored. Others, such as the tendency of diesel fuel to lose efficiency during cold weather, require somewhat more innovative solutions. 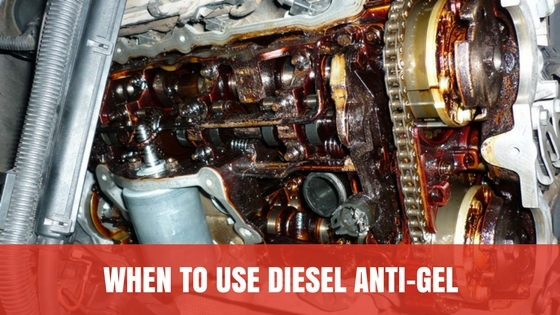 One of those solutions, diesel anti-gel, works to prevent some of the problems which are commonly encountered in diesel engines during colder weather. Diesel fuel will crystalize, or "gel," in cold temperatures. This process can be accelerated during a cold snap, or a sudden drop in temperature, particularly if an engine isn't being run. Like cholesterol clogging an artery, this can cause serious problems over time. Slow to Start: Difficulty in starting an engine, due to the buildup of gelled fuel in fuel lines and filters. Gelled diesel fuel forms a waxy solid "paste" which interferes with the delicate balance required for the engine's ignition process. It takes less buildup than that which would create other, more severe long-term problems to completely prevent a diesel engine from operating. Sputtering or Faltering Operation: The accumulation of crystalized diesel fuel can lead to unreliable engine operation. A diesel engine exposed to cold temperatures can sputter or falter in its operation, and may stall out unpredictably if it can't get enough fuel through the fuel lines. Reduced Fuel Efficiency: The efficiency of a diesel engine makes it one of the marvels of modern industrial engineering, with diesel-powered trucks and automobiles far outstripping their gasoline-powered counterparts in terms of fuel economy. Unfortunately, as gelled fuel builds up during cold weather exposure, that fuel efficiency is the first thing to go. Long-term Damage: A diesel engine is a finely engineered piece of equipment, the product of more than a century of innovation and ongoing development. Some of its components and operations require a surprisingly fine-tuned level of precision operation. With gelled fuel gumming up the works, improper function can lead to serious engine damage over time, requiring expensive repairs and potentially mandating replacement. Diesel anti-gel affects diesel fuel in the same way that salt affects water: it lowers its freezing point, allowing the fuel to remain in a liquid state at lower temperatures. This helps to protect it from long-term exposure and cold snaps alike; just add the anti-gel to your tank before filling it with fuel, to ensure a thorough and even mixture. Below 32 degrees Fahrenheit/0 Celsius: Diesel begins to gel at temperatures below this threshold. Adding a small amount of anti-gel at this point will allow your engine to continue running smoothly. The lower the temperature gets, the more you should add; follow all product directions accurately. Be particularly attentive when you reach sub-zero on the Fahrenheit scale: the crystalization process will take effect more quickly, and more rapidly. Sudden cold snaps become more likely, as well as more problematic. In Anticipation of Sudden Drops in Temperature: If the weather is calling for cold snaps, and you're already adding some anti-gel to your diesel due to the existing steady temperature range, add more as a precaution. During the winter, you may want to get in the habit of adding anti-gel to your tank every time you fill it up, as a precaution against unexpected drops in temperature. Engine Falters, or Runs Rough, in Cold Weather: This is a serious red flag for a diesel engine. Nine times out of ten, the problem involves gelling fuel clogging the fuel lines or the filters. Add additional anti-gel as soon as possible; this situation merits an emergency pit-stop, as a drop of a few more degrees in temperature could cause your engine to fail. Make certain that you always have an emergency kit, including anti-gel, during cold weather operation.